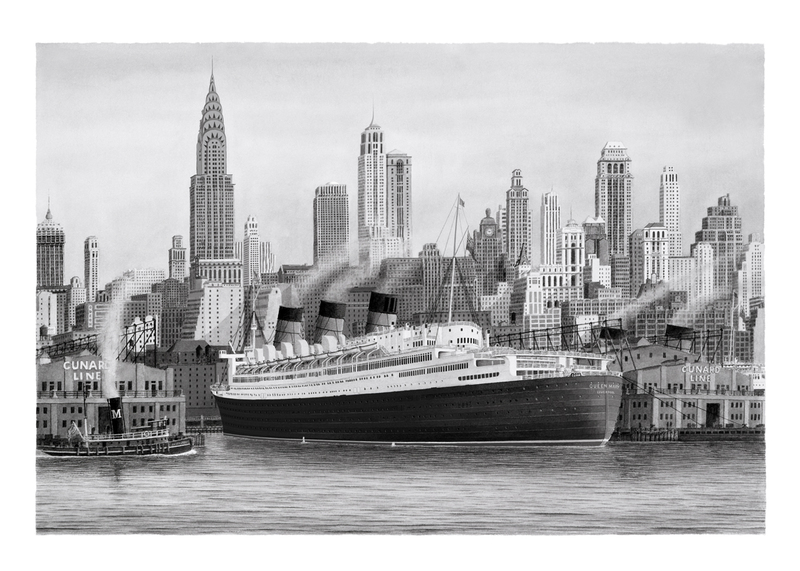 I’ve always been inspired by the glamour and magic of the Atlantic Liners and Manhattan skyline of the 1920’s to the late 50’s, and this is my first attempt to try and capture some of that essence. 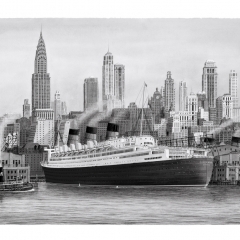 I chose to show the Queen Mary at her Cunard Line berth on the Hudson River, with the Manhattan/New York skyline as a backdrop. I decided to do this in an Indian Ink wash on water-colour rag paper. This painting was done using brushes only, The white is just the white of the paper, as using a white ink would have destroyed the whole effect. The biggest challenge in doing an ink wash is, if I make a mistake, I have to throw it away, and start again! Once the black ink is on the paper, you can’t remove it, or cover it up! 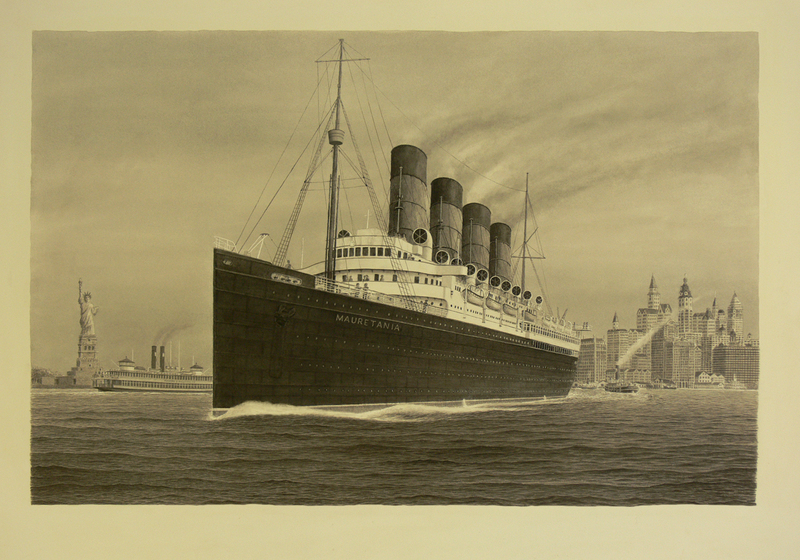 The RMS Mauretania was launched on the 20th September 1906, and began her Maiden Voyage on the 16th September 1907, breaking the Blue Riband Record for the fastest Atlantic Crossing, a record speed of 25 knots – a record that she held until 1929 – 22 years! 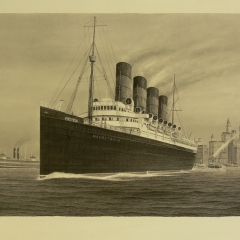 Built in Newcastle by Swan Hunter & Wigham Richardson for the Cunard Line, the 33,200 ton liner was broken up in 1935. 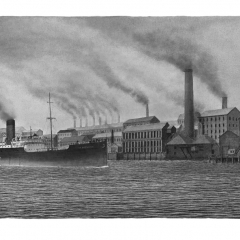 This depicts SS Grestation, an old tramp steamer, making her way up Newcastle-upon-Tyne in the early 1920’s. 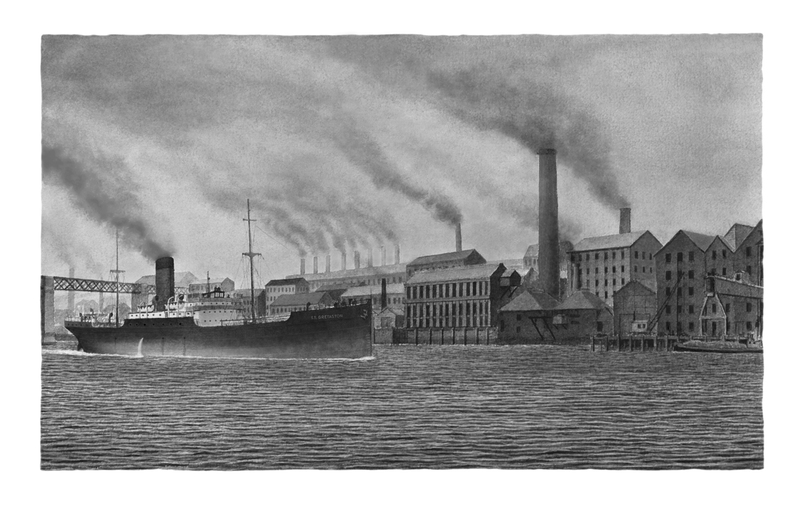 I have always had a fascination of Industrial Revolution scenes like this, as I do see some beauty in an ugly industrial environment like this, where everything is man-made except the water and the sky, and even those are obviously polluted by man! As you may have noticed – there is not a tree in sight! The Polly Woodside was launched in Belfast, Ireland in 1885. 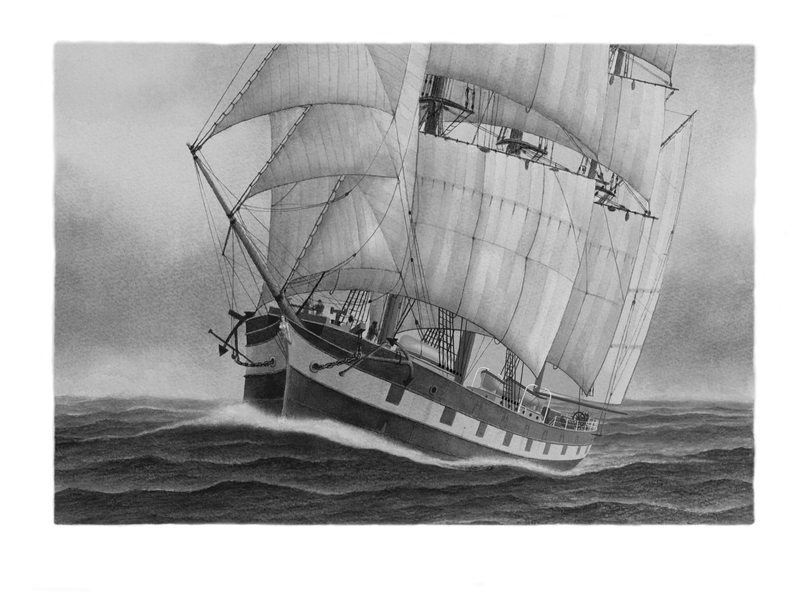 From then until 1904 the ship made 17 journeys carrying various cargos to nearly all parts of the world and rounded the dangerous Cape Horn 16 times. In 1904 she was sold to a New Zealand shipping company, and renamed “Rona”, and operated on the Australia–New Zealand run. 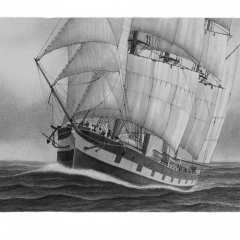 By 1968 the Rona was the last square rigged ocean going sailing ship still floating in Australian waters. In that year her then owners, Howard Smith Industries sold her to the National Trust of Australia for one cent for restoration, under original name Polly Woodside. Restoration was completed in 1978, and she is now on public show at her dock on the Yarra River in Melbourne. A very fitting finale for a ship that has more than served the purpose that she was originally built for. As my ancestors from both sides came out on this ship, I had no choice but to research and paint this ship! All these convicts were chained together hand and leg, cramped in below decks without fresh air, exercise, or sanitary facilities, and hardly any food, for most of the journey. Governor Phillip made a full report to the homeland, but in the end the perpetrators of this shameful incident escaped any punishment. The Second Fleet was shameful blot in English history. 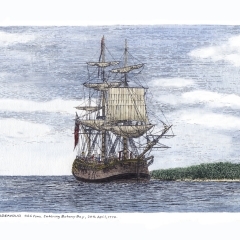 Captain Bligh’s ship, HMS Bounty at anchor in Tahiti in 1788. Built in Hull in 1784 as the collier, Bethia, she was purchased by the Royal Navy in 1787 and renamed Bounty. The Bounty departed on her infamous journey from Spithead two days before Christmas in 1787, and arrived in Tahiti on the 26th October 1788. After five months there, on the 4th April 1789, they finally departed Tahiti for the West Indies. 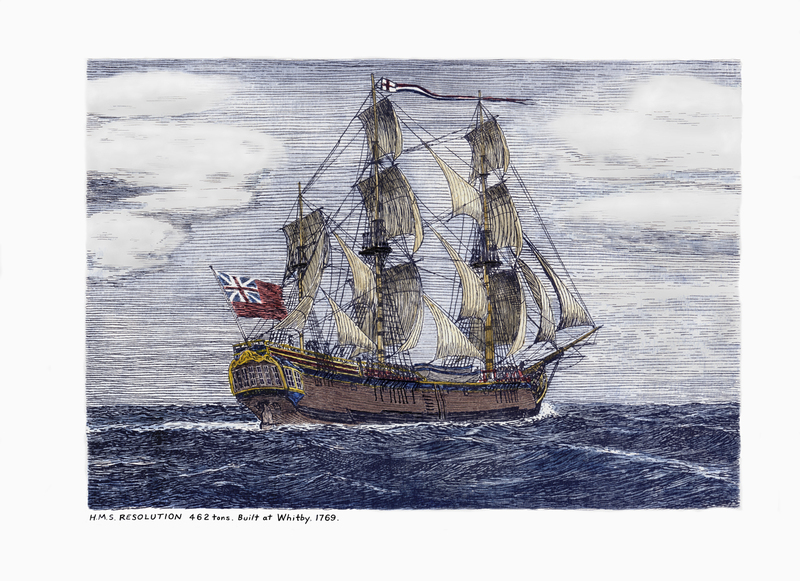 By this time there was a lot of conflict on board, particularly between Bligh and Fletcher Christian, and early in the morning on the 28th of April, the mutiny took place with Bligh and 18 crew were forced into one of the ship’s boats, and left to fend for themselves. They arrived in Timor 41 days later on the 14th June after an epic voyage of 3,618 miles in an open boat. Meanwhile the Bounty with her mutineers returned to Tahiti where some stayed, after Christian and a few others decided to sail to Pitcairn Island, after fearing that justice may catch up with them. After taking what they needed from the Bounty, they then set her on fire to cover their tracks. *Print of a brass-plate etching. 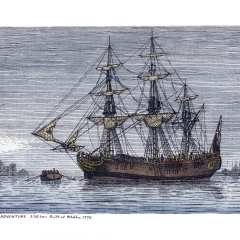 This etching is of the two Naval First Fleet Ships depicting them in Sydney Cove after the rest of the fleet had departed for their return voyage to England. Supply and Sirius remained as a support and defence for the new settlement. Go to my GALLERY 2 page for more details about these two ships. *Pen & Ink Sketch with water colour wash. 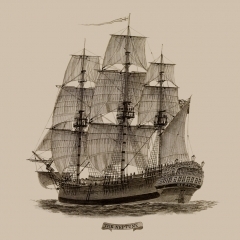 Built and launched in Whitby in 1764 as the Earl of Pembroke, this collier was purchased by the Royal Navy in 1768, and re-named Endeavour for a scientific expedition under the command of Captain James Cook. In August 1768, Captain Cook and his crew departed from Plymouth, on an expedition of discovery that has never been equalled. After rounding Cape Horn, the Endeavour then headed North-west to Tahiti to scientifically observe the 1769 transit of Venus across the sun. After successfully completing that task, they then set out to search for the so called Great South Land. In October 1769 they had arrived in New Zealand. 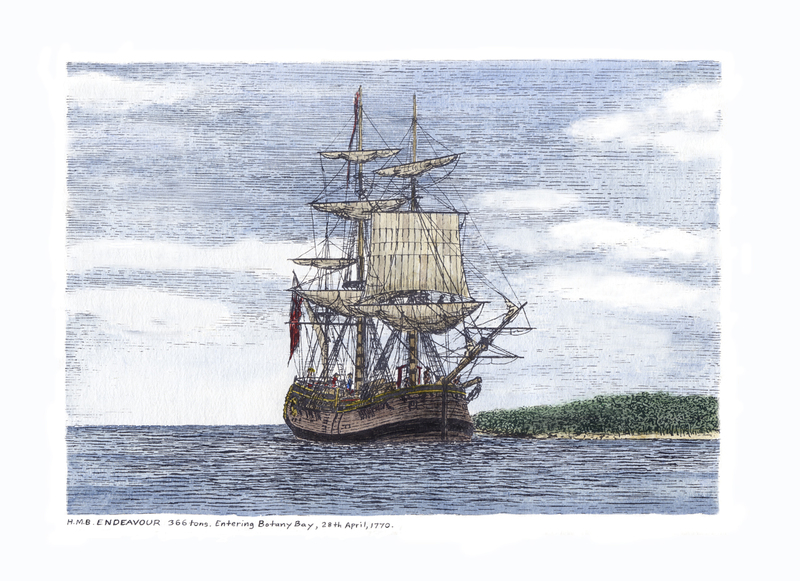 After accurately charting most of the New Zealand coastline they set sail westward again, and in April 1770 Endeavour became the first sea going vessel to reach the east coast of Australia, when Cook and his crew went ashore at a bay he named Botany Bay. 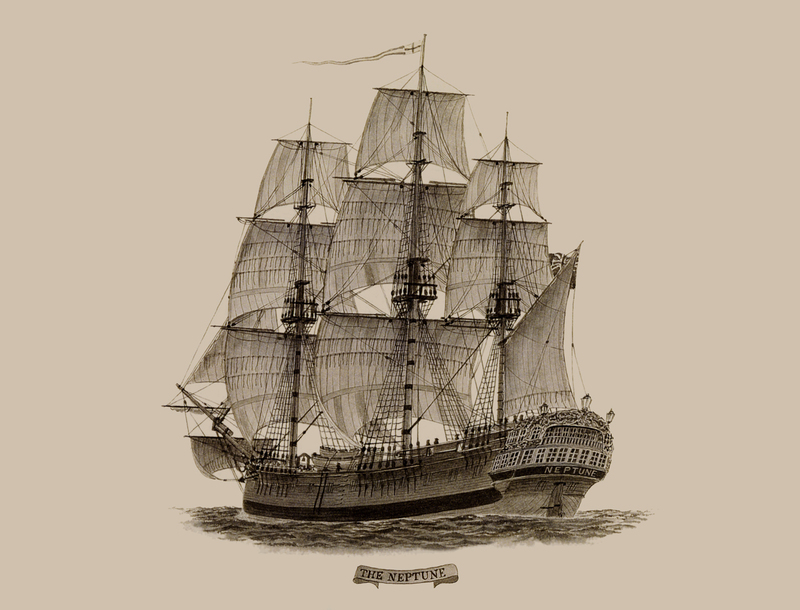 Endeavour then set sail towards Cape of Good Hope for the journey back to England, arriving in Dover on the 12 July 1771. Endeavour spent the next 3 years transporting Naval stores to the Falkland Islands. 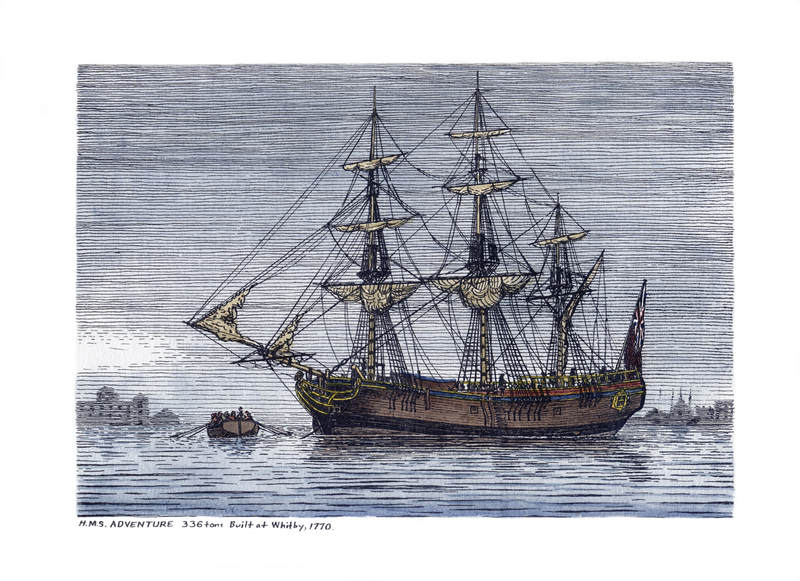 She was then sold to private hands in 1775 returning to Naval duties as a troop transport during the American Revolution War, and was scuttled in a blockade of Narragansett Bay, Rhode Island, in 1778. A sad ending for such an historic ship. 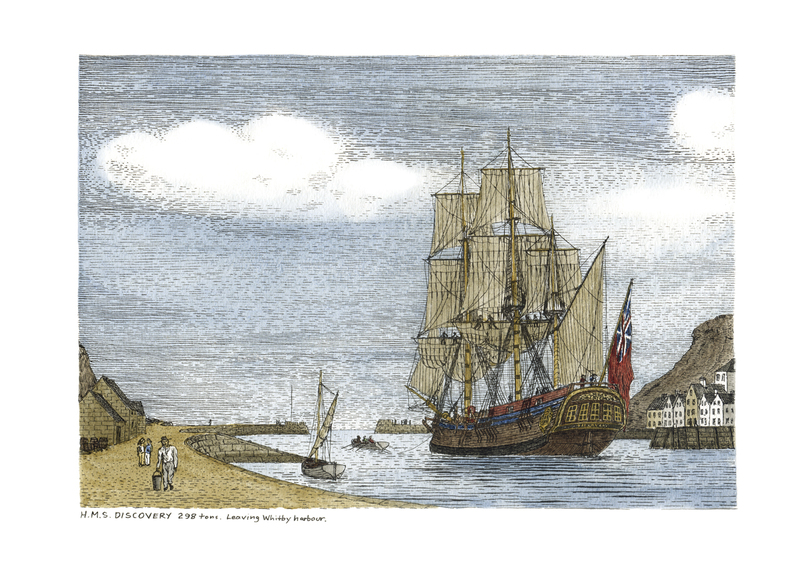 Captain Cook was commissioned by the Royal Society of London to make a second expedition to the South Seas. Cook would have been happy to sail in the Endeavour again, but she had been sent to the Falkland Islands as a store ship. In September 1771 the Admiralty instructed the Navy Board to purchase ‘two proper vessels for service in remote parts’. This task was given to Cook, who found two ships, the Marquis of Granby and the Marquis of Rockingham. They were both barques built at Whitby by Fishburn, who had also built the Endeavour. 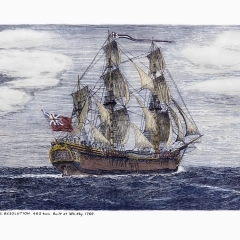 The two ships were then fitted out and re-rigged and re-named as Resolution and Adventure. The two ships departed Plymouth on 13th July 1772. On the 17th January 1773, were the first European ships to cross the Antarctic Circle. Set in Whitby Harbour, Yorkshire, where all of Captain Cook’s ships were built, and of course, where he started his maritime career. I went to Whitby for a one day visit and stayed five days! So needless to say, I had to include it in a sketch! 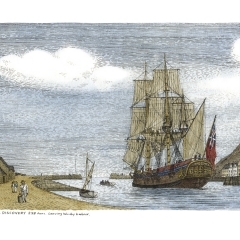 Built at Whitby in 1774 as the Diligence, collier brig, she was purchased by the Royal Navy, and renamed Discovery, and changed her rig to fully rigged ship, to accompany Captain Cook in the Resolution on his third expedition. Both ships became separated due to weather conditions a few times while charting the South Sea Islands from Easter Island to Vanuatu, and Norfolk Island, before heading east towards Cape Horn on the journey homewards, with the Adventure arriving back in England in 1774, while Cook on the Resolution continued to explore the Pacific Ocean, returning to Spithead on the 30th July 1775, after sailing 70,000 miles in 3 years and 18 days. Built in Whitby as the Marquis of Granby a collier, in 1770 and bought by the Royal Navy in 1771 for Cooks 2nd voyage, she was recommissioned in February, 1776 for Cook’s 3nd voyage, accompanied by the Discovery. The two ships departed Plymouth on 12th July 1776, and sailed to the Pacific Ocean via Cape of Good Hope. After visiting New Zealand they headed north via Tahiti and discovered the Sandwich Islands and the Hawaiian Islands. They then chartered the west coast of America to explore the North West Passage, during which Resolution became the first ship to cross the Arctic Circle on the 17th August 1778. After that journey, they headed back to Hawaii, where there was dispute with the natives, and Captain Cook was killed. Charles Clerke took over command of Resolution and after again crossing the Arctic Circle, headed back home and arriving in England on the 4th October 1780. These amazing three voyages earned James Cook the titles of the first man to circumnavigate the world in both directions, and the first man to cross both the Arctic and Antarctic Circles by ship.